Kumar Galhotra was on a high after he returned from the ground-breaking ceremony of Ford India's 400,000-units-a-year plant at Sanand in Gujarat. The happy occasion followed the success of the Figo, Ford's first small car in India, in which his team - he is Vice President, Product Development, Ford Asia Pacific and Africa - played a significant role. "The challenge is increasingly shifting from taking a car designed for Europe and excluding features to get an Indian price, to designing from the ground up for the Indian consumer and then adding features for consumers in the developed world," Galhotra said in a recent conversation with Business Today. At present, Ford and several other global manufacturers do little research and development, or R&D, in India. Even when Indian engineers are involved in a project, much of the work remains a global endeavour. For instance, though Hyundai's new small car, the Eon, is sold only in India, it was a collaborative effort of engineers from South Korea and Hyundai's R&D Centre in Hyderabad. But the role of Indian engineers is growing. Chevrolet's small diesel engine for the Beat was developed by engineers in Whitefield near Bangalore. General Motors' decision to retain full control of its Bangalore R&D operations when it sold a 50 per cent stake in its marketing and sales operations to its Chinese partner, Shanghai Automotive Industry Corporation, is an indication of what Indian engineering means to GM. As a senior executive at GM once told Business Today, "There are certain cards that we always want to keep close to our chest." While Indian manufacturers such as Mahindra & Mahindra and Tata Motors have beefed up their product engineering teams over the past decade and reduced their reliance on international partners, most global manufacturers in the country have been slow off the blocks. India's largest carmaker, Maruti Suzuki India Limited, has signalled its intentions clearly with its plans for a Rs 1,000-crore R&D and testing centre at Rohtak in Haryana. Inala Veerabhadra Rao, Managing Executive Officer, Engineering, Maruti Suzuki, is the man who has driven a lot of that change. At a time when Indian engineers' role was restricted to tweaks, Rao sent a team of 30 engineers to Hamamatsu, the headquarters of Japanese parent Suzuki Motor Corporation. Suzuki was then developing the Swift, and these engineers made India-specific contributions at the conceptualisation stage. Encouraged by that success, Rao and his engineers started to do more work out of India. "We believed in ourselves and began to make bigger changes," he says. This reflected most in the Maruti Eeco, a multipurpose vehicle developed by Maruti Suzuki engineers. It is a modified version of the Maruti Versa, which had bombed. But with small changes and the removal of costly features, the Eeco became a bestseller in its segment. "Our biggest moment was when our parent liked the concept A-Star, which was to become a global model," says Rao proudly. The team showcased its design skills at the Auto Expo 2008. At Auto Expo 2010, Maruti Suzuki unveiled the R3 concept car, which is all set to be showcased at Auto Expo 2012 as the Maruti Ertiga. Rao says Maruti Suzuki's R&D team consists of more than 1,100 people, and more than 130 of its engineers are currently in Hamamatsu, upgrading their skills. Although R&D in India has picked up, there still is a fundamental problem, says Kumar Kandaswamy, Senior Director at consulting firm Deloitte Touche Tohmatsu. 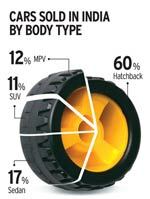 "If India has to become a true small-car hub, it must have the engineering resources to do so. The problem is finding engineers not for big projects such as cars but for component makers. I do not believe there is enough automotive engineering and design talent in India today." Many global automotive companies are choosing India as a launch market for their cars. Hyundai launched the i10 and Eon in India, the Volkswagen Group launched the Vento and Skoda Rapid here. Toyota launched the Etios (a reworked Toyota Echo) and its sister small car, the Liva, here, too. The Nissan Sunny was designed for Indian consumers, and is currently available only in India. Parent firm Renault is showcasing and launching the Pulse small car, a Nissan Micra with a Renault badge, at Auto Expo 2012. But most of these products were designed at the parent companies' overseas headquarters. While Toyota engineers did substantial research on Indian driving and market conditions out of the Bangalore factory, this information was fed back to headquarters. Only the Pulse was designed at Renault's Mumbai-based design lab. Kandaswamy of Deloitte Touche Tohmatsu says that global car companies will increasingly move engineering work to India. "But that is a market-based situation," he says. "Global car companies are likely to have global platforms, though design and features may well be specific to emerging markets, and India is a large emerging market."